CVD brings quirky opulence to Lemony Snicket's A Series of Unfortunate Events, the black comedy-drama series that tells the tale of the three Baudelaire orphans and their evil guardian Count Olaf, who is constantly plotting to steal their inheritance. CVD's team completed almost 300 shots for the third and final season of the Netflix series Lemony Snicket's A Series of Unfortunate Events, as the Baudelaire orphans' quest to escape Count Olaf, played by Neil Patrick Harris, comes to a climax. In this third season, the orphans dodge spiders in dark caves, summit a soaring frozen waterfall, dive deep into the ocean, face death by fatal fungus, and wash up on a desert island – all surrounded by elements brought to life by the visual effects team at CVD. VFX Producer Tom Horton believes CVD was the perfect choice of vendor to help build the uniquely stylized world of A Series Of Unfortunate Events, as imagined by Netflix showrunner Barry Sonnenfeld. Our VFX were not constrained in any way to real world lighting, texturing and even animation, so there was no second guessing the look Barry would want for each scene and every shot. Barry was very impressed after one session with Chris van Dyck – and I can tell you that Barry was very hard to impress! By far the most challenging work for CVD's team of 18 artists came in episodes five and six, jointly titled "Penultimate Peril," set in the quirky art deco Hotel Denouement, with flashbacks to an opulent opera house. The Hotel Denouement sequences were shot on a stage, but to achieve the elaborate look envisaged by Barry, the final shots required massive set extension, all in 4K resolution. For the CVD team, this meant transforming the two-storey set into a sumptuous, nine-storey hotel, complete with an ornate facade, imposing side wings, and intricate roof. Matte Painting Artist Romain Bayle began by using lidar taken of the exterior set to make a high resolution model, with a 3.3 million poly count. "This took advantage of the 3D, to create as many fine detailed passes as needed to match plates properly and allow maximum control," said Romain. "We started with a light pass, then slowly built many texture passes. All these passes were combined in Photoshop to create very high res and detailed matte painting projections using a mix of comped 3D passes and painted layers." Adding to CVD's exteriors work was the creation of a mysterious pond in the courtyard, reflecting the hotel in all its glory – and hiding its many secrets. Compositing Supervisor Erik Jensen said CVD needed control over the ripples in the pond to tell the story in the way Barry had imagined. "The pond was all done in 2D, but there were more than 50 shots where it appeared, from multiple angles, with different sizes in the frame, some during the day and some at night," said Erik. "We also used Nuke's new ray tracer to run our own reflections pass for the pond using the matte painting textures and the geo that was provided." Extending the hotel interior demanded even more detail, full of the myriad quirks that fans of A Series of Unfortunate Events expect - beginning with the ornate railings on every floor. "We began by remodelling a section of the lidar to make a grill of the railing, then exported it to V-Ray Proxy and built out the entire railing for the floor using this one section," said 3D Artist Dmitry Vinnik. 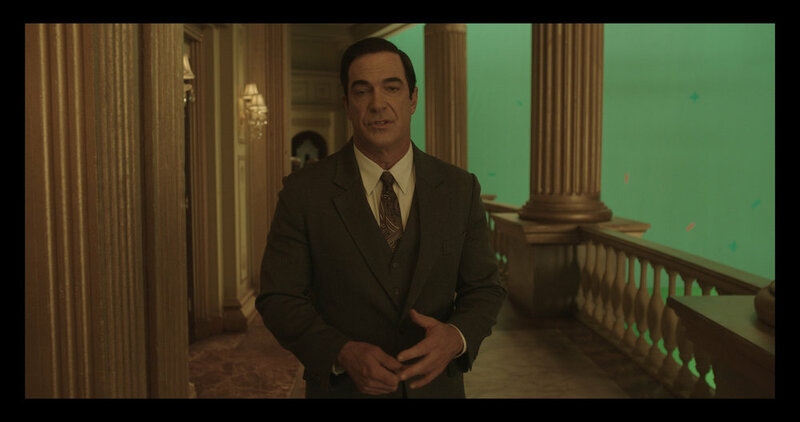 "Once the floor was complete, we exported it to V-Ray Scene and rebuilt the entire set of floors. This allowed for the scene itself to be very light, and allowed versioning and updating to be performed from a master scene." Building out the hotel interior wasn't just a case of replicating every floor and camera move – there was a lot of design work too, expanding on Barry's concept art. VFX Producer Hoyt Yeatman said the crew were constantly shooting off the edge of the set, with a lot of VFX elements required to tell the story. "Chris had a really, really good eye of what looks good and what doesn't look good, and sometimes I think that's often overlooked when you're working with vendors," said Hoyt. "When it comes to artistic endeavours, Chris was really top of the list in terms of coming up with looks that really nailed Barry's vision." It should come as no surprise to fans of A Series of Unfortunate Events that the Hotel Denouement ends up going up in flames – thanks to plenty of fire and smoke work by CVD. CVD's work didn't end there – there was still an entire opera house to design and build, as the show flashes back to reveal secrets of the past. The viewer sees a singer on stage, accompanied from the musician pit, before an audience of hundreds, some seated in multiple balconies. In reality, only one balcony was built practically – and all CVD's shots were views from that balcony. This shot was a big question mark when we started on the project. All we had was a concept previz that was done for the edit, and the only thing that was shot for it was the singer that was going on the stage and a bunch of elements for the crowd," said Erik. "We had to make sure we were able to use and make those elements work together, while at the same time be able to tweak the framing and angle that the director wanted." The team took reference photography at their local Orpheum theatre in Vancouver, and used this to create a 3D model with photogrammetry. "This was used to get a first pass of blocking in front of the director," said Erik. "Once we had some of the bigger questions answered, we got our 3D department to build the whole asset and light it properly, to then get it to final in comp." VFX Producer Tom Horton liked CVD's methodical approach to hitting review notes. "They would often step back and offer up wedges of models, texture or animation if they were unsure of what it was Barry wanted, before proceeding to another iteration," said Tom. "It meant that when we saw new versions, more often than not they would hit the shot notes with impressive precision." Building the opera lobby brought another challenge – the practical set was circular, but the CVD team had to use lidar to fill in the background, which was straight. Dmitry explains that as with the hotel interior, they remodelled the lidar, used V-Ray Scene to export a tile, then cloned it to replicate the opera lobby interior. "A tremendous amount of work went into creating the floor with patterned rails, wallpaper textures, light fixtures, chandeliers, and statues," said Dmitry. Chris is incredibly happy with the work the team did on the Hotel Denouement and opera house shots. "We had a lot of freedom to look at the concepts and show our progress. We essentially were able to propose what we thought looked really nice. I'm really proud of the work, and what a relatively small company and talented team were able to do," said Chris. Tom thought the finished shots were beautiful. "The Opera environment, corridor, and balcony were extremely impressive, as was the interior of the hotel," said Tom. "CVD found a perfect balance between Barry's stylized look and the necessary photo reality required to engage the audience. It was always a tricky balance which CVD navigated perfectly." For Romain and Erik, it was a pleasure to work on one of CVD's biggest projects. "We ended up taking on much more work than what we were initially slated for, and that was in large part because the client was happy with the quality we were providing," said Erik. "That made all of us really happy, because it was a clear sign that we were doing a good job." 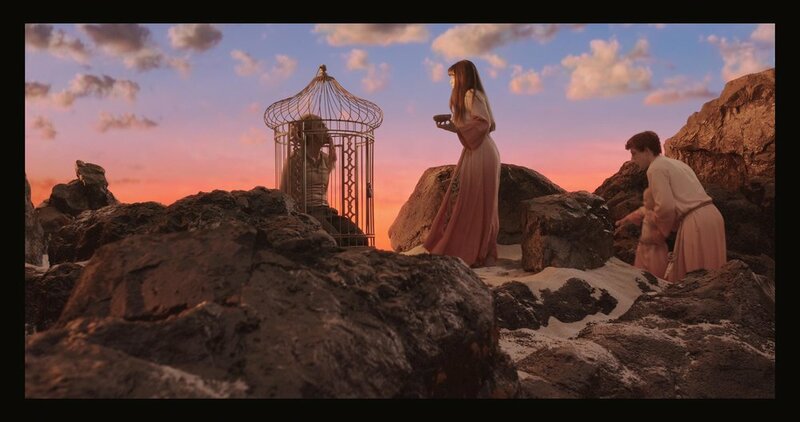 Ultimately of course, CVD's visual effects are there to serve the surreal story of the three Baudelaire orphans, and according to Tom, they do just that. "These episodes have been reviewed by the press and viewers as the jewel in the crown of all three seasons of A Series of Unfortunate Events," said Tom.